Posted on May 14, 2013, in Cocktails! and tagged Food, Grocery store, Humor, Italians, Mateus, Prosecco, restaurants, Shopping, Sparkling wine, Wine. Bookmark the permalink. 29 Comments. That day-glow green bottle is so inviting–like you’re drinking a bottle of skittles. And if a straw’s involved, so much the better. As needed. Adult life is not for sissies. $13 for a glass of wine! Blimey! I thought the UK was pricey! I can buy a decent bottle of Shiraz for under a fiver. Import duties no doubt. Sinful, is it not? Jeez, start making your own. It’s cheaper by the bottle, which creates its own set of problems. I does tend to get very festive, however. Mateus should go well with the Cheetos cheese puffs, no? My dad owned a liquor store. Mateus used to come in kinda crockware bottles and was a go-to for those who got lost between Gallo and the imported stuff. PS: I studied wines as part of my education and still haven’t a clue except for Poully Fousse and Ripple. It ought to come with a skull and a crossbones on the bottle. That brings me back. What a weird, almost unintentional effervescence Mateus has. I could go for a good Mateus bender right now. You’d regret it. It hurts more now. 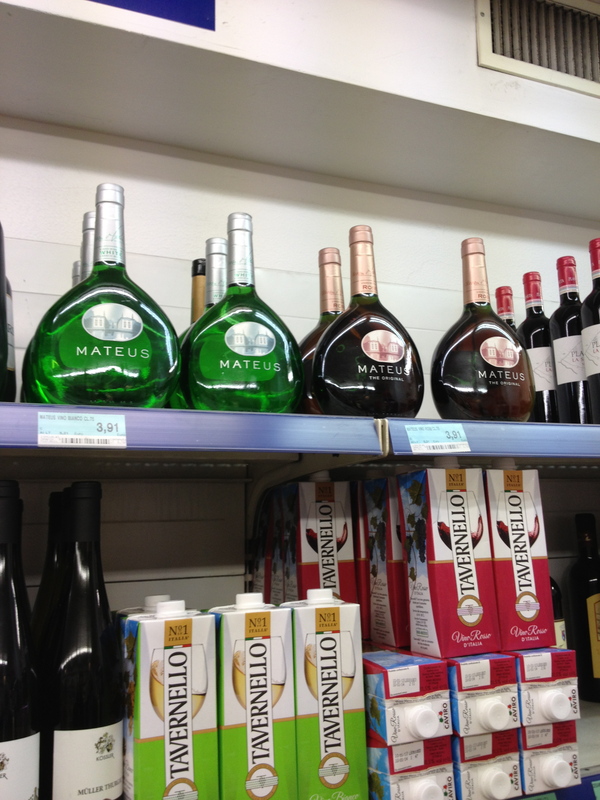 I was born and raised in England and used to drink Mateus Rose quite frequently. I bought a bottle at Christmas for daughter to try, but she didn’t drink it, so of course not be wasteful I did. I have to say I didn’t really care for it, like I used too. I cannot tell you how often I’ve been undone by taking a waste-not-want-not line with leftover liquor. When I was in college, we drank Blue Nun. Remember that? Worst hangovers of my life. OMG Blue Nun, yes I do that wine vividly. I have not seen that in years, Is it still available? I’ll have to check next time I go into the LCBO :). There was a german riesling too which we used to drink all the time Hock???? or something like that. I cannot remember the name to save my life, do you recall that one too? Sorry just as I pressed send it came to me. It was Liebfraumilch…LOL! Not sure where I got Hock______ from. Does that ring any bells with you? Many memories, most of which involve my head and a toilet bowl. I’m channeling my energy into forgetting. Those sugary wine hangovers are hellish.